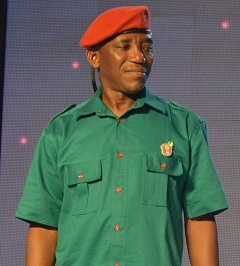 The Plateau State chapter of the All Progressive Congress says the Minister of Sports, Solomon Dalung was never a founding member of the party. The All Progressive Congress (APC) in Plateau State has described as false the claims by the Minister of Sports, Solomon Dalung that he was a founding member of the party. On the contrary, the state chairman, Latep Dabang said it was not in doubt that he once served as a caretaker committee chairman in Langtang South local government area of the state during the immediate past administration of Jonah Jang. Dabang, who spoke over the weekend in Jos, said the minister’s recent allegations against the Simon Lalong led administration was nothing short of the fact to incite the people against the government. Dalung had accused the Plateau state government of mismanaging an over $2 billion loan collected, and of lying about the state of security in the state. For the embarrassment his outbursts has caused, the state party has reported the minister to President Mohammadu Buhari through its national headquarters, to call him to order.